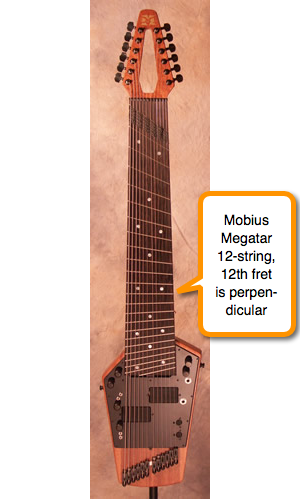 I'd like to understand how to draw a multi-scale fretboard. I'm aware of tools like FretFind2D, but I'd like to do the maths on my own. I thought of having the center of the bridge at point (0, 0) in the coordinate system. But at what angle will I have to draw the bridge? And what about the nut? Firstly, I assume the strings spacings at the bridge are measured across from the high e nut/saddle perpendicular to the fret board centreline (FBC). This seems the only logical way as it not affected by the level of fanning so what string spacing measures traditionally; 'neck width feel' is consistent with non fanned guitars. If you're using string spacing parallel to the line of the string end points this method will need adjustment as two knowns and unknowns swap. Draw a large diagram, not proportional, Exaggerate some dimensions (eg make bridge string spacing (BSS) double or so nut string spacing (NSS) to make angles ect easier to see. do this for both e strings. Position the perp fret (PF) on the high e.
calc the distances from the PF to the low e and high e nut and bridge points parallel to the FBC. A few more steps will give the bridge and nut angle, I can add them if it's not obvious. There are a few very small triangles near the low e bridge and nut, they could be missed, thats why skewing the diagram is important, it makes them more easily seen. On every multi-scale instrument that I have seen, there is one fret position where the fret is the closest to completely perpendicular to the strings. Different builders have each chosen a different point. It seems to me that this fret position has a lot to do with the ease of playing of the instrument, ergonomically speaking, and this has to do with the overall scale length of the instrument. The calculation of the angle of the nut and the bridge would be dependent upon which fret position you choose to be the perpendicular fret, in addition to the scale length you choose for the lowest string and the scale length you choose for the highest string. I have taken some images off the web to illustrate this. 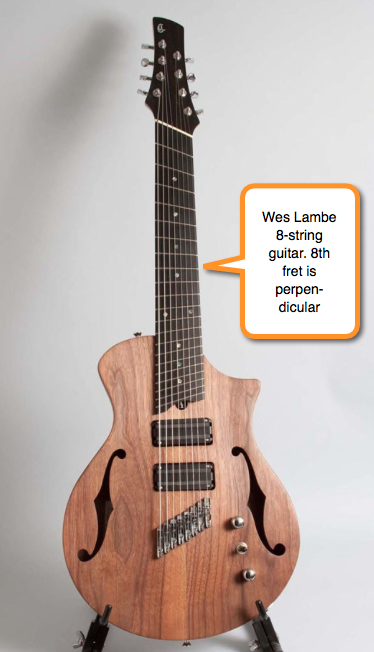 You can see which fret is chosen as the perpendicular fret, and you can see the relative angle of the bridge and nut of each instrument, which depend on the difference in scale lengths chosen by the designer, between the longest and shortest string. There is a great deal of variability in these designs. How does the angle of strings above the headstock affect tone and stability?